Can you believe Christmas is over and the new year is almost here. It feels like we just decorated our bed and breakfast for the Christmas events and now we are only days away from taking down the tree and unplugging the outside lights until next December. Even as this year draws to a close, we still have a lot going on in our quaint little village. This New Year's Eve will be the second celebration of "First Night" in Sandwich. The events are centered around Main Street and Shawme Pond, which is literally at the end of our driveway. All of the festivities are family friendly and run from 4:00 pm until the beginning of the finale at 9:00 pm. A food court will be conveniently located in the Sandwich Library parking lot on Main Street. Outdoor activities are free and access to all indoor events is obtained with the purchase of the First Night Button, which is available in advance online or at numerous locations around Sandwich. The buttons are $10 each for adults and $6 for children 12 and under. Kids under 3 attend for free. Indoor activities for the kids include mask making and puppeteers. The very special Bioluminescence Parade begins at the Wing School at 6:00 pm and will proceed down Main Street. There will be numerous musical and dance performances at various locations throughout the village. All of the festivities lead up to the "Grand Countdown" that will be held by the Dexter Grist Mill on Shawme Pond. The countdown features one of the fabulous Michael Magyar "Giants" which will be lighted at 9:00 pm to celebrate the beginning of 2014. A special treat at this year’s First Night is the kick off of the year-long celebration of Sandwich’s 375 Anniversary. Although the village was founded in 1637, it was not incorporated until 1639. 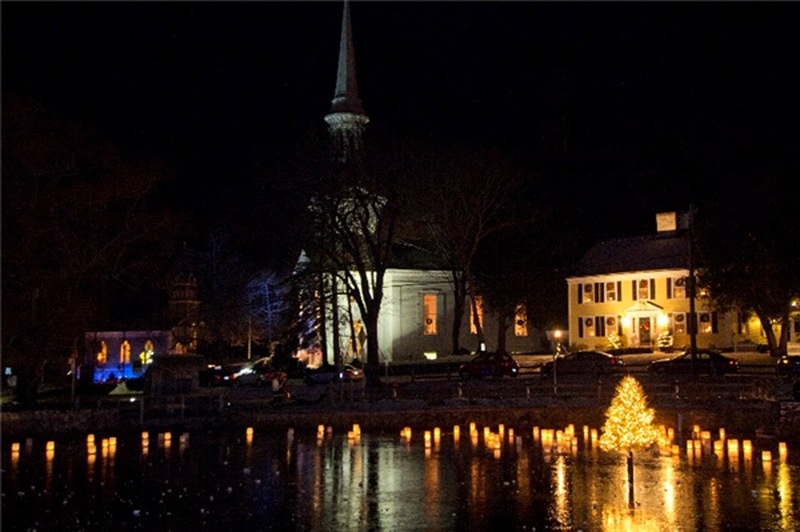 From January through December, 2014, special celebratory events will be going on almost every month to commemorate the founding of the oldest town on Cape Cod. Here at the Inn the tree will still be up and we are welcoming guests. See our packages that include Buttons to First Night to help you celebrate the arrival of the New Year. We hope you will join us for some of the many special 375th events throughout 2014. The Sandwich 375th website has a listing of these events and the details. Our 375th Special will be posted on our website. With the Autumnal Equinox on September 21st, Fall has officially arrived. 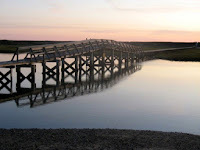 With it comes mild days and cool nights and perfect weather for outdoor activities in Cape Cod. We are looking forward to beautiful leaf color this year and lots of visitors at our bed and breakfast inn. Fall is such a wonderful time to visit Sandwich. The Sandwich Glass Museum has some great exhibits for those rainy days and Heritage Museums and Gardens is still open where you can enjoy the colorful foliage. There is still time to see "Driving our Dreams: Imagination in Motion". Strolling the 100+ acres of the botanical gardens is a joy in the fall. All of the restaurants in Sandwich are open and, for your dining pleasure, not nearly so crowded as they are during the summer months. You will find everything from the superb fine-dining a the Belfry Bistro to the casual setting at Seafood Sam's. The Sagamore Inn is still open and serving great Italian food and fresh seafood. Their lobster roll remains, in Charlie's opinion, one of the best on Cape Cod. The Aqua Grille has changed hands and has a terrific new seafood menu. There is still time to sit in one of their Adirondack chairs on the lawn overlooking the marina and enjoy a cocktail. In the early evening, dinner on the patio is nice as they have a fire pit for warmth. The Brown Jug has just installed their fire pit out on the patio for the season. On Saturday and Sunday afternoons, Gregg Harper's dulcet tones can be enjoyed with a tasty cheese platter and wine or you can ask Michael to prepare a warm drink for you. 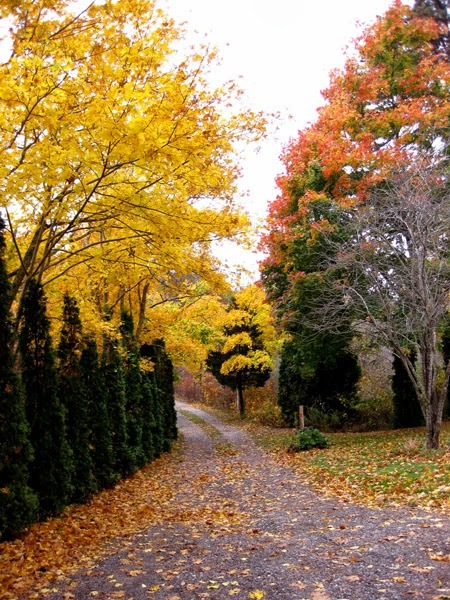 There is no better way to enjoy the fall than a visit to Sandwich. As you stroll about out quaint, historic village, you will catch the aroma of logs burning in antique fireplaces, fall wreaths adorn many of the front doors of homes that are 200+ years old, and the trees are sporting their fall attire. Take a walk through Old Town Cemetery for a history lesson of the town's founding families. 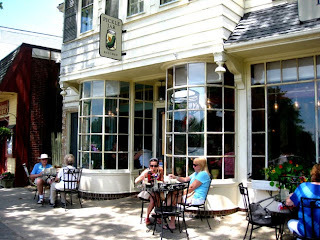 Stop in at the Dunbar Tea Shoppe for a pot of tea, served the English way, and one of their succulent treats. All around Sandwich there are hidden paths to hike, rivers and streams to kayak, and trails to bike. Come for a visit and we will provide you with maps and directions to wherever you would like to go. One of the nature habitats we love on Cape Cod, and one of the places we encourage guests staying at our inn to visit, is the Massachusetts Audubon's Long Pasture in Cummaquid. It is one of those little hidden treasures on the Cape and is such a beautiful place to visit for hiking, kayaking, and exploring the beauty of the marshes of Cape Cod Bay. In addition to the many wonderful things to do there, On September 21st, 2013, that will be the location for the First Annual Barnstable Harbor Oysterfest. It is an opportunity to learn about the oyster farms of Barnstable and to enjoy a wonderful late afternoon event featuring tastings from some of Barnstable's great restaurants. The event will feature oysters from Cape Cod Oysters, Wianno Oysters, and Barnstable Sea Farms. Some of the participating restaurants are the Barnstable Tavern, the Dolphin, Mattakeese Wharf, Osterville Fish Too, and the Naked Oyster. 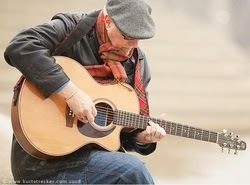 Along with the food will be Cape Cod Beer, wine, and chamber music to enjoy. The musicians are members of the Cape Cod Symphony. Even though you may not live on Cape Cod, this is a wonderful event to enjoy while visiting and you will be supporting the efforts of the Massachusetts Audubon Society, the Barnstable Land Trust, and the Barnstable Village Civic Association. The mission of these nonprofit organizations is to protect the environment we call home for future generations of residents and visitors to this beautiful area. The event will be held under a tent on the grounds of Long Pasture located at 345 Bone Hill Road in Cummaquid from 3 pm to 6 pm. Tickets are $100 each and can be purchased on line from the Barnstable Oyster Fest website. 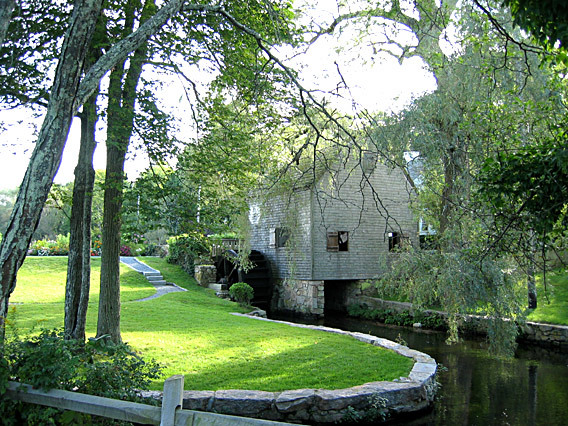 One of the first grist mills on Cape Cod is located right here in Sandwich Village and just across the street from our bed and breakfast. You can visit the mill during the summer months to learn about a little piece of Sandwich history and watch as they grind corn just as it was done in the 1640's. The mill got its' name from the Dexter family, which was one of the original ten families to settle in what is now Sandwich in the year 1637. They built the mill as a community resource to grind corn for making bread. During this time in history, corn was a main staple for families trying to survive in the harsh new world of New England. In 1640, the mill was located at the bottom of lower Shawme Pond so that the water power could be harnessed to drive the paddle wheel. 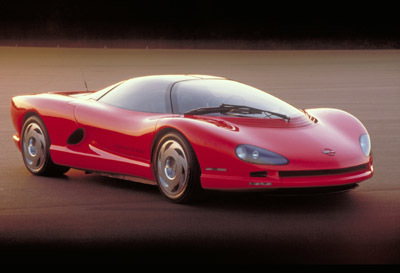 After being idle for decades, an historically accurate restoration began in the 1960's. The process returned the mill's machinery to the earliest type used in this country. It is once again driven by water power from the adjacent pond. As you tour the mill and watch as its' work is performed, it is difficult to imagine the effort and skill required during the 1600's to create the massive, grooved, grinding stone and mechanical leveraging necessary for the grinding process. 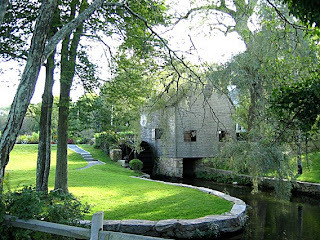 The Dexter Grist Mill stands proudly today as a memorial to the early inhabitants of Cape Cod and their creativity and determination to survive. It is one of the most photographed sites on the Cape making it the Cape's own Motif #1. The mill is located adjacent to the Sandwich Town Hall in the heart of historic Town Hall Square and is surrounded by 17th and 18th century homes. One of these restored homes is the 1750 Inn at Sandwich Center where we proudly welcome guests and even on occasion serve Rosemary Roasted Corn Muffins made from cornmeal ground at the Dexter Grist Mill. All is good in New England, the Red Sox are leading their division, yes I know its way early, but any time we are out front of the New York Yankees is a good thing. Even better than the Red Sox for us Cape Coders, is the fact that the Cape Cod Baseball League starts playing this week. 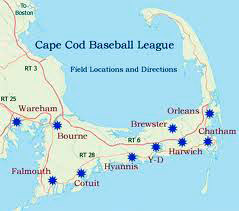 The CCBL is a one of the country’s premier leagues for displaying college level talent. Select college players from all across the United States are invited to spend the summer on the Cape playing for one of the ten teams in the league. Nine of the teams play at Cape Town’s from Bourne to Orleans and the tenth is just over the Bourne Bridge in Wareham. All ten teams kick off the season with games on Wednesday and you can see a game somewhere almost every night of the summer until the playoffs start on August 6th. The Cape league, in addition to providing great summer time entertainment to the locals and visitors, is a major proving ground for prospective Major League Baseball players. In the 2013 MLB draft held June 6-8th, the Draft’s number one overall pick by the Houston Astros was Mark Appel who played for the Yarmouth-Dennis Red Sox in 2011. The second pick was Kris Bryant who played for the Chatham Anglers and at number six was Colin Moran who played for my team, the Bourne Braves. In fact twenty of the top thirty-three first round picks spent their summers playing in the CCBL. These new draftees will be joining the 253 other CCBL alumni that played on MLB teams in the 2012 season. The alumni includes catcher Buster Posey of the World Champion San Francisco Giants who was the National League Rookie of the Year in 2010, National League MVP and batting champion in 2012, and leader of the team that has won two of the last three world series. In 2006 and 2007, you could have watched him all summer as he played shortstop for the Yarmouth-Dennis Red Sox. If you like baseball and plan to visit Cape Cod, stay with us at our Sandwich Inn and we will direct you to the ten great fields. All of the regular season games start between 5:00PM and 7:00PM. You can spend the day visiting the many Cape Cod attractions and at the end of the day catch a game. Better yet, if you have a relative or favorite local college player in the CCLB, stay with us and we’ll help you with a sight-seeing schedule around their games so you can end each day viewing his next game. Check out the full Cape Cod League ten team schedule and pick the dates to stay with us based on the local team you want to support or the future MVP you want to watch. 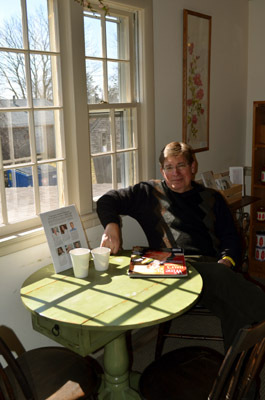 Note: Charlie Preus is the assistant innkeeper, wine steward, and general entertainment for the guests at our inn. Farmers' markets on Cape Cod have been multiplying in recent years to meet the growing demand for locally grown foods. From Sandwich to Provincetown and the islands of Martha's Vineyard and Nantucket, no matter where you are visiting, it is easier than ever to find a farmers' market. Varying in size and types of products, the modern farmers' market provides much more than the fruits and vegetables of yesterday. With new growing techniques and the interest in organically grown products, terms such as hydroponic, aquaponics, sustainable agriculture, and dietary movements such as slow food and raw food are becoming more familiar. Here in Sandwich we are fortunate to have two farmers' markets each week. 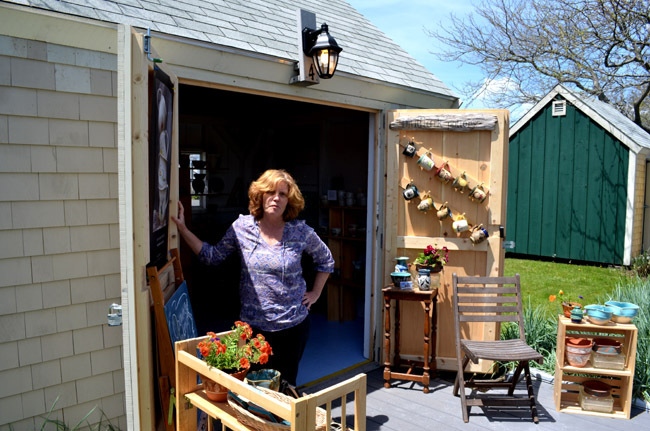 On Tuesdays from June to October, purveyors of an array of locally produced products populate booths at the Sandwich Farmers' Market on the Town Green at 164 Route 6A. 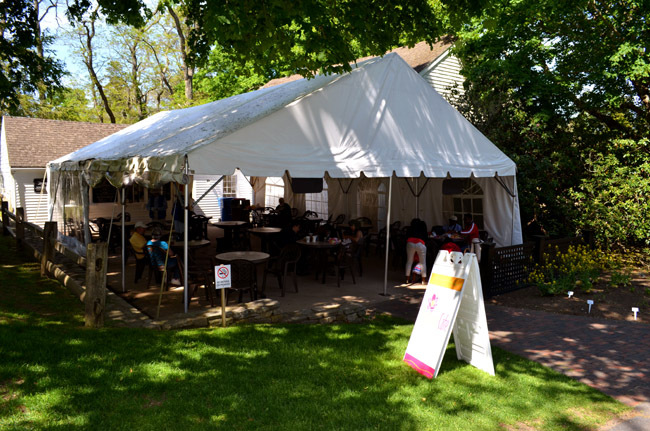 From the end of April through early October, a field at 34 Mettinghouse Road is the site of the Oakcrest Cove Farmers' Market. This market is open from 9 am until 1 pm. Booths with breads, handmade soaps, live lobsters, cheese, pasta, wine, pastries, fruits, herbs, veggies, and other local products for your shopping pleasure are available at both Sandwich Farmers' Markets. Some of the purveyors you will find are Burgess Farm, Salty Lou's, Fromage A Trois, E & T Farms, Dave's Cape Cod Smokehouse, Pain D'Avignon, Summer House Natural Soaps, Nantucket Wild Gourmet Smokehouse, Coastal Vineyards, and Allan Farm. The farm at Camp Burgess in Sandwich is a year-round organic farm growing vegetables, herbs, and producing eggs. A flock of dwarf goats "mow" the weeds and a recently adopted barn cat is the resident mouser. This educational farm teaches campers about local and sustainable farming as they learn about the cost of food and the importance of farmers in any culture. Of the food produced at the farm, some is used in the camp's dining hall, some goes to the Sandwich Farmers Market, and a portion goes to local food pantries. Salty Lou's from East Sandwich, a direct to you lobster business, sells live lobsters that are harvested from Cape Cod waters. Fromage a Trois from West Barnstable, a pasta and cheese shop, sells handcrafted cheese and pastas. E & T Farms from West Barnstable has hydroponic vegetables, herbs, blueberries, and their local honey. Dave's Cape Cod Smoke House from Harwich has natural hickory smoked meats, fish and shellfish. He has a different produce for each season of the farmers market. Pain D'Avignon from Hyannis, a traditional French bread bakery, sells their wonderful fresh-baked breads. 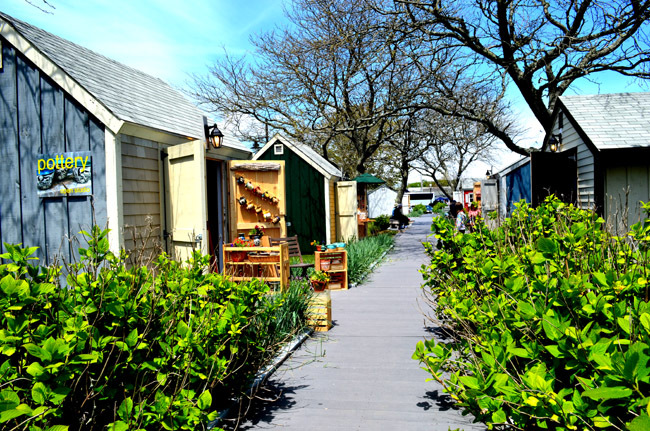 In addition to their handcrafted natural soaps, the Summer House Natural Soaps from West Barnstable sells their herbs and flowers. Nantucket Wild Gourmet Smokehouse from Chatham sells the smoked salmon that they make, and Coastal Vineyards from South Dartmouth has boutique, local wines. Allan Farm from Westport, MA has organic greens, herbs, and produce. Honey I'm Home from Plymouth, MA has a selection of their products that are made with local ingredients. 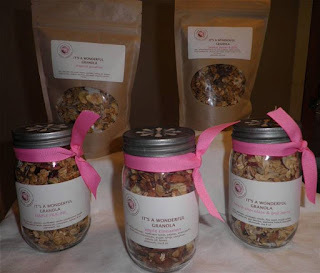 Some of the yummies you will find in their booth are breads, granola, galettes, cookies, and cupcakes. 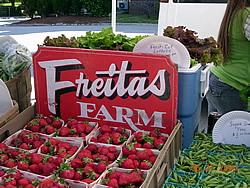 Other farms with booths at the Sandwich Farmers Market are Freitas Farm from Middleborough, MA, with fruit and veggies, and J. H. Beaulieu Livestock and Produce Farm with their naturally-grown and field raised beef. Visit a local farmers' market and support your local farmers and artisans. Regular updates on the vendors appearing at the Sandwich Farmers' market are posted online at Buy Fresh Buy Local on Cape Cod. 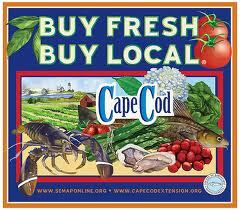 You can also see a map that shows locations of farmers' markets on Cape Cod, Martha's Vineyard, and Nantucket. 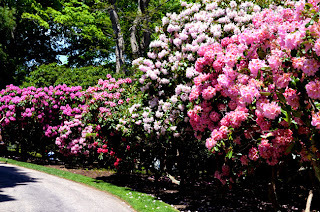 One of the most stunning events of the season at Heritage Museums & Gardens is the Rhododendron Festival with the blooming of their 10,000 rhododendrons from late May to early June. This occurrence is breathtaking in the sheer volume and numbers of these bushes. What is so exciting is the uniqueness of some of the colors and varieties. Charles Owen Dexter once owned the farm that is now Heritage Museums & Gardens. His life-long love of gardening led him to hybridizing rhododendrons. He raised thousands of these beautiful plants around the property that he, with the help of a landscape architect, had turned into a country estate. He was able to produce plants with heavier foliage and larger blossoms of superior color. He produced thousands of seedlings annually and was very generous in sharing them free of charge with nurseries, other horticultural gardens, friends, and acquaintances. The Dexter rhododendrons are among some of the best in the region. 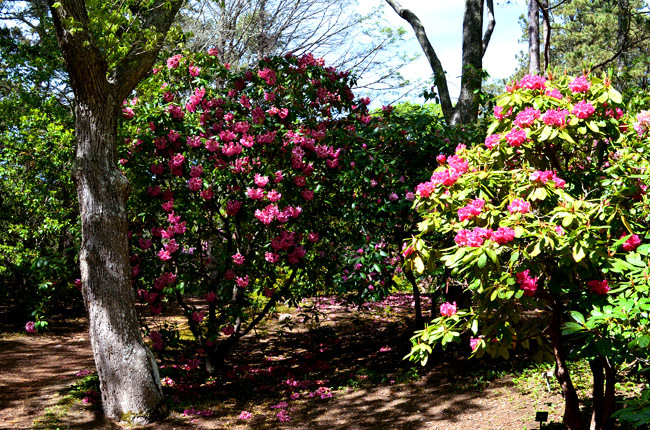 The Heritage grounds are covered with rhododendrons but there is an area devoted to the Dexter rhododendrons. When you purchase your ticket to tour the gardens and museums, you can get a map showing where this area is. On a recent beautiful and sunny afternoon, we donned our walking shoes, grabbed the camera, andheaded up the hill from out bed and breakfast to Heritage Museums & Gardens to see the rhodies. 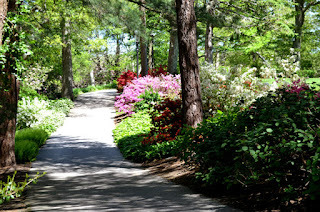 We have a membership to the gardens and have been there many times, but have never made it to see the rhododendrons in full blossom. I also had promised Charlie that, if he would go with me to see the rhodies, I would go with him, again, to see the concept card exhibit in the auto museum at Heritage. The truth is, I really wanted to see the car exhibit again and he enjoyed the walk around the gardens. We hope you come to Sandwich this year and take the opportunity to visit this crown jewel of Cape Cod. If the rhodies aren't blooming, something else beautiful will be. Stay at our bed and breakfast and choose our "Sandwich by the See Summer Fun" package, we include tickets to Heritage Museums & Gardens. For one week each year, restaurants throughout Cape Cod offer three to four course dinners at special prices. The 2013 Restaurant Week runs from Monday, May 13th through Sunday, May 19th and is a wonderful opportunity for diners to try new restaurants or just visit an old faithful. Participating restaurants have designed prix fixe menus that are at $25, $30, or $35 dollars plus tax and gratuity. The choices in cuisine include Mexican, Brazilian, Italian, French, Mediterranean, and American. You may want to participate in the Cape Cod Restaurant Week photo contest. After you have chosen a restaurant, order one of the items from their prix fixe menu and when it arrives, snap a photo. Information about the contest and how to participate is posted on the Restaurant Week website. This website lists the participating restaurants with information about each one and in some cases gives their prix fixe menu. Some restaurants are offering special items along with their dinners. The Black Cat in Hyannis includes a glass of wine. Alberto's Ristorante, also in Hyannis, is including a bottle of wine with their dinner or you can choose your own bottle from their wine list at a reduced price. The restaurant 400 East in Harwich is offering a complimentary bottle of wine with dinner for two. The Cape Sea Grille in Harwich Port is extending their special to a few specific dates after Restaurant Week. Call them or check online for these additional dates and times. The Dolphin Restaurant in Barnstable Village is including a glass of house red or white with their special dinners. A complete list of participating restaurants and a map featuring their locations is available online to help you in planning your Cape Cod Restaurant Week visits. Be sure to call and make your reservations early to insure that you get a table at the places of your choice. What a great way to try something new and possibly find your next favorite place to dine on Cape Cod. 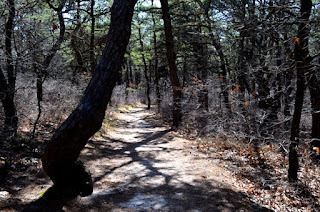 The weather this time of the year on Cape Cod is perfect for hiking. On a recent sunny day, we decided to go for an outing down Cape. 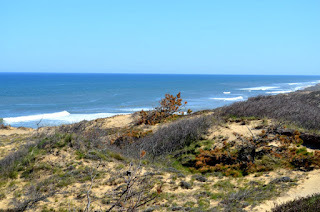 As Wellfleet is one of our favorite places to visit, we thought we would stop by the beach, maybe take a short hike, and then have lunch at one of our favorite restaurants there. 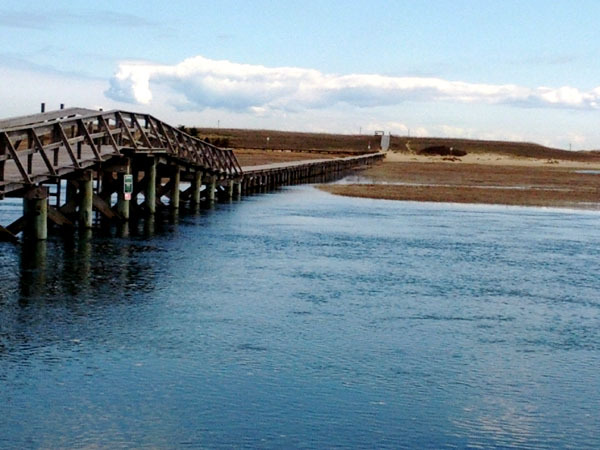 Wellfleet is about a 45 minute drive from our bed and breakfast in Sandwich. In late April, when the traffic is very light, we made it in a little less time. 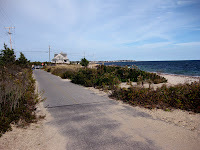 That is the wonderful thing about visiting Cape Cod in the spring, there is not a lot of traffic on the roads and no long lines in restaurants. Our first stop was Marconi Beach which is located on the Atlantic Ocean side of the Cape. Off Route 6, you turn right at the sign for the Marconi Station Site. Be careful to watch for cyclists as the bike trail crosses this road just after you make the turn. Follow the road to the end where there is plenty of public parking. This beautiful public beach is part of the Cape Cod National Seashore. It is named for Italian inventor Guglielmo Marconi, who in 1903 orchestrated the first wireless communication between England and the United States from this area. This time of the year the beach is nearly deserted except for a hearty few like ourselves. The view from the top of the cliffs is stunning. Recent winter storms have really taken their toll on the beaches of Cape Cod, both the Atlantic beaches and the Cape Cod Bay beaches. Here, the stairway down to the beach was severely damaged and is currently barricaded to prevent access. Repairs are scheduled to be completed by the beginning of the summer season. 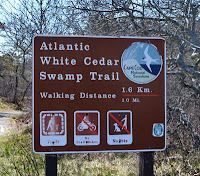 Next we headed to the place that was the intent of our trip, the Atlantic White Cedar Swamp hiking trail. The entrance to the trail is back down the road towards Route 6. From this direction, and just before the bike trail crossing, you turn right and travel past the National Seashore Headquarters to the parking area. The hiking trail begins at the parking lot. This is an easy 1.2 mile trail and perfect for a first hike of the season. You may want to wear a hat and use some bug spray if you are visiting in the summer. There are mosquitoes and ticks in the area. This is a difficult area for vegetation but behind the dunes flourish golden beach heather, broom crowberry, and bear oak, and the pitch pine that is so common here on the Cape. 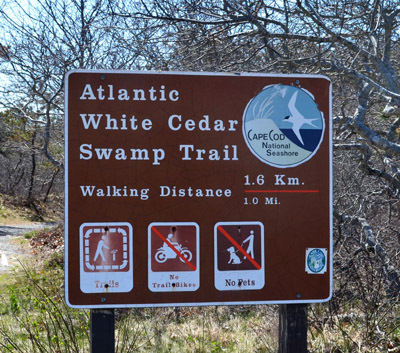 What is so uncommon in New England and on Cape Cod is the white cedar that you will see once you arrive at the swamp area. The first part of the trail flows downward, but not at a difficult pitch, as you make your way to the swamp. Not to fear, once you get there you will follow a meandering walkway that has been constructed so that your feet will remain dry and the vegetation will not be disturbed. Once inside the swamp where there is more moisture, you are likely to see checkerberry, mayflower, and some wild sarsaparilla, all of which love the acidic soil created by decaying leaves and other organic matter. You will feel the temperature drop slightly and the humidity rise as you descend into the swamp. The white cedars grow in the water of the pools that are scattered throughout. Follow the walkway to the other side of the swamp where you will enter the pathway back to the parking area. This path is slightly elevated but not a difficult hike. Before you leave the area, wander across the parking lot and take the walkway up to the observation deck. The view of the beach in both directions is spectacular. Come visit us at our bed and breakfast and we will provide you with information that will help you in your exploration of Cape Cod. 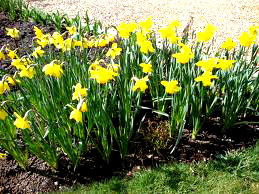 When spring comes to Cape Cod, we can have lovely and sunny days but it can remain a bit chilly until late April. The winter this year has been harsh so, when we have a sunny day, it is wonderful to get out of the inn and find a bright spot to have lunch or coffee and a sweet treat. A delightful place to do this is MoMo's Food Emporium in East Sandwich. Today was one of those days. We bundled up and got in the car heading east on scenic Route 6A. The drive alone was wonderful, with the sun glistening off the water at almost high tide on Scorton Creek and all the little ponds along that stretch of road. The swans on one of the ponds were also enjoying the sunshine. We are so fortunate to live on this side of the Cape that meanders along Cape Cod Bay with such lovely views of the bay and salt marshes. All along the road are signs of spring in the purple and yellow of the crocuses and daffodils and the faint green color in the shrubs and trees as they begin to bud. It is such a wonderful feeling of renewal that causes a lifting of the spirits in a most joyous way. Momo's Food Emporium is nestled along Route 6A between the road and the marshes in East Sandwich. As you step in the door, you almost forget that you came to have lunch when you see the cakes and pastries that fill the case in the front of the shop. 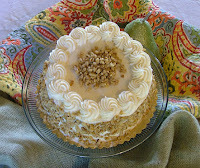 My eye landed on a hummingbird cake and I began to salivate. Maybe later......First, deciding what to enjoy for lunch. After ordering a cup of the Spicy Asian Chicken Soup and a sandwich, we looked for a table in the sunniest spot with a view and settled in. The soup was amazing and what a perfect lunch on a chilly day. The fresh and delicious ham and cheese sandwich we shared was on a very tasty multigrain bread with a wonderful texture. Momo's serves George Howell's Terrior Gourmet Coffee and it is really good. We sat in the sun enjoying the food and the view of the marshes along Scorton Creek. As I was about to nod off from a full tummy and warmth of the sun, I remembered that Hummingbird Cake and headed for the pastry case. On the way, I was distracted by the largest brownie I have ever seen. Having been seduced by a hunk of chocolate many times, I just had to have it and Charlie agreed to share it with me. I think he was worried I would try to eat the entire brownie, which I am sure I was capable of. It was a moist, chewy, chocolaty piece of heaven. Charlie is not a person who craves sweets as I do, but even he was emitting small humming noises as he savored the moment. Momo's is a lovely place for lunch but it is so much more. There are wonderful dishes to pick up for dinner, a nice selection of imported and specialty foods, and they cater parties and gatherings. Last Thanksgiving, I picked up all of the side dishes that I served for dinner here. What a treat that was. 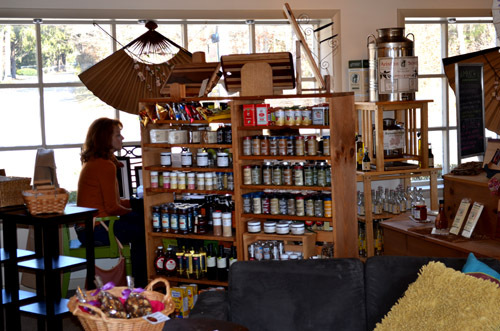 The works of local artisans are featured in the shop and Neila, the owner and chef, conducts cooking classes. 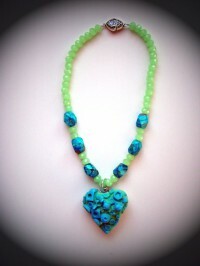 Be sure to peruse their website. We always tell our guests they should stop in for a treat but we have decided to put this charming emporium on our list of regular places to frequent for either lunch or our afternoon snack..... they do, after all, have 4 C's Ice Cream. Maybe we will see you there. Theatre flourishes on Cape Cod, even during the winter months. Innkeeping keeps us so busy during the summer and fall that we seldom have the opportunity to venture far from Sandwich, nor do we have the time to indulge our passion for live performance. While there is wonderful theatre available throughout the Cape year round, it is in the off season months that we are able to experience one of our favorite forms of enrichment, community theatre. Having spent some time in both the visual and performing arts, few appreciate the work and energy that goes into a live performance as much as I. I think I enjoy most sitting in a darkening theatre as the house lights go down, the stage lights bloom to life, and the performers take the stage. When the music begins my heart races in anticipation. As the lyrics waft out over the audience, I am in heaven....and trying with all my might not to sing along. 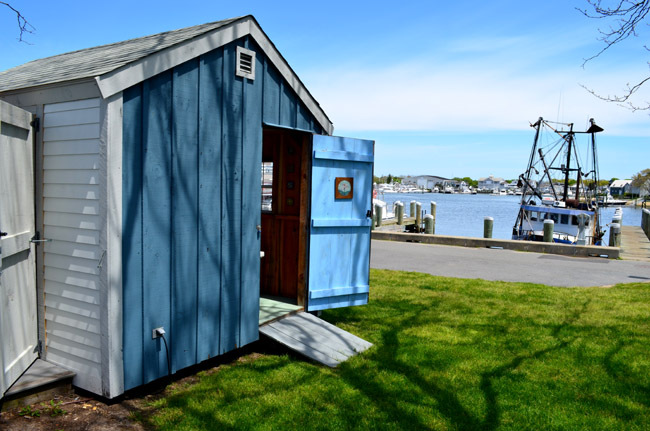 During what has been an awful winter, we were looking for a way to have some fun and checked out the Cotuit Center for the Arts website to see what was currently available in the gallery and the theatre. 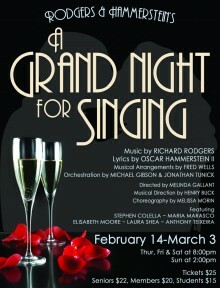 We were pleased to see that the current production is Rogers and Hammerstein's A Grand Night for Singing. Little did we know just what a treat we were in for. Our anticipation was such that we arrived an hour early so that we were insured the perfect seats, and we got them without too much pushing and shoving. A real stroke of luck was that we were also able to spend the waiting time viewing their current art exhibit, Making Waves. One of the wonderful things about small, community theaters is the intimacy between audience and performers. The main performance space at the Cotuit Center for the Art is magical. Patrons sit in comfortable seats at bistro tables. The fact that wine and treats are available is a real plus for oenophiles like us. Director Melinda Gallant and Music Director Henry Buck selected a talented group of singers and created a wonderful production for this 2013 season. Just prior to the opening of the show, center Executive Director David Kuehn took the stage to welcome the audience and invite folks to become members. His bid was charmingly and creatively presented to the tune of My Favorite Things. The talented cast was led by veteran performers Maria Marisco and Stephan Colella and rounded out by Laura Shea, Elisabeth Moore, and Anthony Teixeira. The four-person orchestra was the perfect balance for the singers, never overpowering nor underwhelming; of particular importance as the singers were not using microphones. From the opening number, The Carousel Waltz, to the closing medley of Impossible and I Have Dreamed, and with only a couple of missteps, the performances of all five singers were captivating. The missteps were handled so well and with such humor that one would think they were planed. 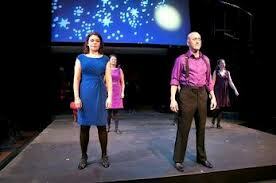 All five cast members presented their individual numbers wonderfully and with great emotion. I particularly enjoyed the ensemble pieces as these five voices blended so well and, at times, produced a vibration that was exhilarating. I am sure everyone in the audience had their favorites, as did I. While I thought all five cast members gave terrific performances, Maria Marasco dazzled. The consummate actor, her stunning soprano voice and perfect phrasing, as well as her obvious love of performing, were a joy to experience. Another stand out performance was Anthony Teixeira. This young performer has an abundance of talent. The performance we attended was first rate. The night seemed to fly by leaving the audience wanting more. I am thrilled that we will have the opportunity to see this production again as A Grand Night For Singing will be performed on the stage or our newly renovated Sandwich Town Hall, conveniently located just across the street from our bed and breakfast inn, on Saturday, March 9, 2013. It is difficult to believe that January is almost over, but here we are. It is a time for introspection and for planning. We hope you are giving some thought to a visit to Cape Cod this year. If you are, we hope you will come to Sandwich for a truly wonderful vacation or, if time only allows, for a quick get-away. We love helping guests celebrate anniversaries and birthdays. You may think it is a bit premature to be planning a trip here this early in the year but, if you want to visit in the warmer months, you should give some thought to making those accommodations reservations now. 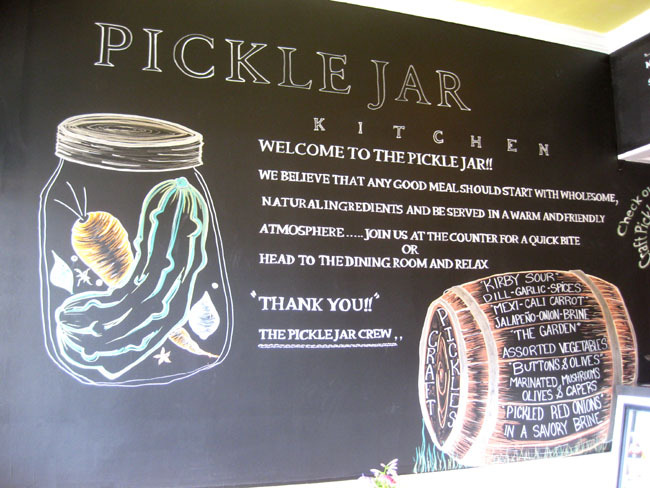 Sandwich is a hugely popular place for weddings and planning ahead is important if you are to have a wonderful place to stay while you are here. If you are attending a wedding in Sandwich this year, you may have already seen the 1750 Inn at Sandwich Center listed on a "save the date" card. Many brides who have chosen one of the beautiful settings in Sandwich for their wedding send out these cards to people who will be attending encouraging them to make their lodging reservations as soon as possible. If you have any questions, we hope you will give us a call. We would be happy to help you in any way that we can. 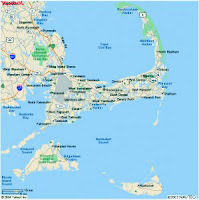 If you are a first time visitor to Cape Cod, there is a wealth of information on our website about the Cape and Sandwich. As our lovely and quaint little village is the oldest in the area, there is much historic and wonderful here. Our inn is nestled historic Town Hall Square and is just across the street from the world renowned Sandwich Glass Museum and the recently renovated Sandwich Town Hall. Just up the street you will find the 1600s Dexter Grist Mill, which operates grinding corn during the summer months, and the Hoxie House, the oldest home on Cape Cod. Just a short walk up the hill is Heritage Museums & Gardens, surely the Crown Jewel of Cape Cod. Exploring these wonderful places will fill a day for you quite easily. 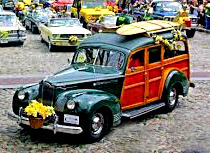 Sandwich is a great place to choose as a base when you are planning your vacation. 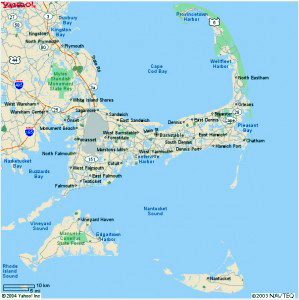 You can easily day-trip to the islands of Nantucket and Martha's Vineyard from here. If you are going to Nantucket on the 9 am ferry, we will happily send along a take-away breakfast for you to enjoy on the hour-long ferry ride over to the island. Be sure to check out the packages we have put together for you convenience in visiting these lovely islands. We offer several packages that may be helpful to you in arranging you visit here. We have a "Whale Watch" package that offers two locations from which to depart and a "Sandwich by the See" package that has tickets to some of the most wonderful attractions in Sandwich and is a wonderful package for a great three-day get-away. 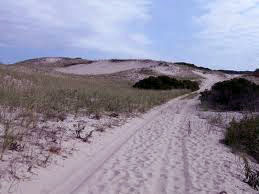 A trip to the Cape would not be complete without a stroll on the beach. 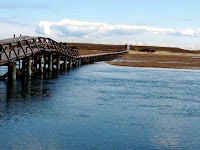 We have lovely beaches here and our Sandwich Boardwalk was recently named one to the most beautiful in the world. Best of all, it is just a short walk from our bed and breakfast inn. Come for a visit. Our promise to us is a pristine and charming place to stay and the warmest hospitality on the Cape....Your Innkeepers, Jan & Charlie.